Today is Sunday, December 23. Two days before Christmas and Robert is still working on his Christmas cards. Ack! The pressure! (Oh, who am I kidding? Robert feels no pressure whatsoever since he does not have any concept of deadlines). I picked up Robert this morning and he is staying with us until Wednesday morning (although, remember, that’s just between us). Robert had a pile of unopened Christmas cards at New Home which he enthusiastically read once we got back to my house. I explained who everyone was if he couldn’t place them and he said, “That’s nice” after reading each card. Being the borderline hoarder that he is, he will no doubt save them forever (I just realized I do the same thing!). Robert is feeling better (except still having intense seizures) and I am also feeling better. No one else in the household has caught the nasty bug going around (knock on wood) so we are getting back into the swing of things. Which, for this time of year, means working on that never ending pile of Christmas cards. Yep. Robert is still working on them. Unfortunately, he will not be able to finish them all but it isn’t because he hasn’t tried. Do you want to work on your Christmas cards, Rob? How about just signing ‘Love, Robert’ on the cards? Then proceeded to write several, painstakingly slow sentences. He wants to send the cards but he also wants to write what he wants to write. What can I do – I have to pick my battles and, call me crazy, but rushing him on Christmas cards can't be a battle (you know, because of that whole peace on earth and good will toward men thing). I am resigned to the realization this is probably Robert’s last year sending Christmas cards. Unless we get started in July. Hmm, maybe . . . I apologize if you don’t get a Christmas card from Robert but please don’t think it was because we weren’t thinking of you! The cards weren’t in any particular order and he just did them as he could. So if you didn’t make the cut, don’t take it personally (and know that if we do cards next year, you'll be the first in the pile!). Robert basically writes the same thing on all his cards, only changing the salutation and signature so please consider this a Christmas card to all of you! Because Robert lives in a care facility paid for by his Medi-Cal coverage, he is only allowed to stay overnight somewhere else 73 nights in a year. That may seem like a lot until you count up weekends, holidays, vacations plus the occasional doctor visit that happens late in the day or early in the morning where an overnight visit would be more convenient or when someone is sick and might be better cared for by family. I am not asking the state to pay for Robert to stay at my house overnight but do want the care facility to be paid. I also don’t want to have to pay the care facility close to $200 a night for taking him out of the facility on night 74+. Call me crazy but that seems a bit excessive. I mean, there are a lot of nice spas/hotels charging a comparable rate and I guarantee you Robert is not getting spa service over here at our house. He might get Rocky Road ice cream or chocolate Frappuccinos from Starbucks but spa service – um, no. Nobody is leaving fancy chocolates on his pillow. (Quick note to hubby: I wouldn’t mind fancy chocolates on my pillow!). Apparently, the state doesn’t care about the actual days – just overnight visits. I could, theoretically, pick Robert up first thing in the morning and return him to his care facility a minute before midnight and it wouldn’t count toward the 73 days. Considering he lives 45 minutes away (one way), this solution isn’t that appealing to me. Although, for purposes of this story, that’s exactly what happened. Oh wait. First, you are getting sleepy. Very sleepy. Look at this shiny object. You are getting sleepy. Now repeat after me: Robert did not stay at our house overnight this week more than one night. Now that we’re clear about what did or did not happen, and I can probably take the 5th if ever asked about it and I know where to find a good lawyer, I’m pretty confident I can continue with the story. I picked Robert up at his facility on Saturday and it was immediately clear he had a cold. By Sunday morning, he was running a fever but it went away by mid-day (letting him sleep all morning and loading him up on Tylenol helped). We had a family party to attend and, although we were late, we got there just in time for lunch and a gift exchange. To Robert, this was perfect timing. Once we were back home, I got Robert settled on the couch to relax with a box of tissues and a Frappuccino. We had several recordings of Jeopardy so he couldn’t be happier. While he watched television (and dozed), my daughter and I tackled the outdoor Christmas decorations! Richard came out to figure out the most efficient way to hook up several dozen extension cords (you think I’m kidding) and after just a couple of hours, Phase I was complete! Robert continued to feel the effects of a cold and didn’t eat a lot at dinner. By Monday morning, he was again running a fever and coughing quite a bit. Being the paranoid sister that I am (hey, his hospital stay in May for pneumonia and sepsis has me a little wary of colds), I took the day off and had him rest and see a doctor. She ordered a chest x-ray mainly to appease me which turned out to be clear. When Robert has a cold, he gets very wobbly and it’s as if his legs turn to Jell-O. He moves slow to begin with but when he’s sick his usual two hour routine in the morning of bathing, dressing, eating and grooming (all done independently) become impossible tasks without help. It takes me a few minutes to know whether or not I should step in to help because I don’t want to step on his independence but once I do, he’s always very appreciative. You get the idea. He may be sick, but he’s polite. He woke up without a fever on Tuesday (yay! We’re on the mend!). He went to Day Program but Hubby picked him up early so he wouldn’t overdo things. Robert and Richard spent the afternoon together while I was at work. Robert watching Jeopardy and relaxing and Richard washing all of his bedding (Now that I think about it, I guess I should be leaving Hubby chocolates on his pillow). On it went until we shouted “TEN” and broke into cheers! Robert grinned from ear to ear. After dinner, he went to bed a little early and seemed well enough on Wednesday to last a whole day at Day Program. He was still wobbly but Day Program is flexible enough that Robert could enjoy a quiet activity for the day. Just a movie and quiet time and then back to his care facility where he can stay until this weekend. They know he’s been sick and are keeping an extra eye on him and (hopefully) helping him get around until his legs get their strength back and his balance returns. It’s this sort of collaborative care and communication with his other caregivers that I wished the state was concerned about instead of how many overnight visits one client may (or may not) have. After all, isn’t this sort of collaboration what keeps people healthier? Out of hospitals? Happier? Saving the state money? Oh, you can wake up out of your trance now. Just remember, this was all a dream and this did not happen. It may not be Epilepsy Awareness Month (No! It's go-crazy-for-Christmas month!) but there were so many resources people shared, I thought it would be helpful to have them consolidated in one place. At the end of November we recapped the organizations and resources that were founded by some of the people interviewed throughout the month. The ones included in this list are the other resources that are important to the people who were interviewed plus a few others I found that might be useful. Kathy Patterson and her daughter, Jenny. Kathy tragically lost her 18 year old daughter, Jenny, to epilepsy. At Jenny’s memorial service, Kathy and her family requested donations be sent in lieu of flowers to the Epilepsy Foundation. Gwen told us about her daughter, Cindy, and shared social services agencies that have been helpful to them. To my knowledge, our family wasn’t aware of the services ALTA provides so Robert wasn’t a part of their organization until just a few years ago. I have found them to be extremely helpful to us in finding various resources for Robert (such as his day program) and am grateful he is now involved. The list will grow as more people tell their story about epilepsy or caregiving. 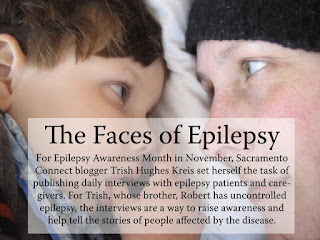 I am planning to run more interviews throughout the year so if you’re interested in telling your own story about epilepsy or caregiving (or know someone who wants to tell their story), please contact me at robertssister@att.net. The more we share, the more we help each other! For someone who claims to be fairly anti-social and introverted (me), I do love a good Christmas party! We have two parties planned for today as well as one or two several items left over from my to-do list yesterday. I participated last year and had so much fun! I was introduced to new sites helpful to caregivers as well as had fun visiting other caregivers with their own blogs. It’s interesting to visit the other caregiver blogs because I learn so much more about caregiving! Whether it’s how to have a sense of humor even while watching Hubby disappear into Lewy Body dementia or learning how to gain the strength it takes to help your child through an undiagnosed heart defect which eventually led to Pulmonary Arterial Hypertension and a possible future heart/lung transplant or teaching how to take a calm, healthy approach to caregiving while also educating about senior LGBT caregiving issues, all have something for someone. Other caregivers are participating as well and more usually join throughout the week. If you are a caregiver and want to join, please visit here to find out all the details. Oh!! And there are prizes! Who doesn’t love to get a gift at the holidays (or any time!). Caregiving.com is hosting this blog party and there are door prizes for visiting and commenting on that site. Easter is our goal date now . . . This morning, Robert woke up with a fever, cough and one of his eyes almost swollen shut (which I’m assuming is from a sinus infection). I’m letting him sleep in and haven’t yet made the call whether or not we attend Party Two. Hubby’s family gets together for great food (they never disappoint in that area!) as well as a fun ornament exchange. Robert is always invited and it’s fun to see people I don’t get to see often enough. Hubby and I usually keep our eyes out for clever ornaments throughout the year so we can pick just the right one for the party. I would hate to miss it but, unfortunately, caregiving throws a lot of curve balls and doesn’t really care what time of year it is (or what party might be missed). I’m hoping Robert will be feeling better with a little more sleep. There’s the promise of meaty lasagna which he will not want to miss! Robert is definitely not anti-social or introverted – the boy loves a party and, well, food. Plus, he has to get better so he can work on more of his Christmas/Easter cards today! Hope you can join us this week for the holiday (blog) party!